Hey Mar Roxas and Joyce Ramirez, if you want more after this, just let me know. During my first two hours speaking at the #CocoyGate #SenateHearing and possibly owing to first time jitters, the #NasaanAngPangulo scandal accidentally slipped my tongue. I was really very nervous then, and since I swore to tell the whole truth and nothing but the truth, I virtually told every truth that was in my mind at the time. In PR terms, I think that slip of mine was a miscalculation, no matter how minor. That slip could have totally derailed the #CocoyGate issue, so I was really relieved that it didn’t. Regardless, mainstream media “tried” to report on it: “tried” because the articles that came out were essentially slanted in favor of the accused, with none of them – except GMA News (Thank you!) – asking for my side. 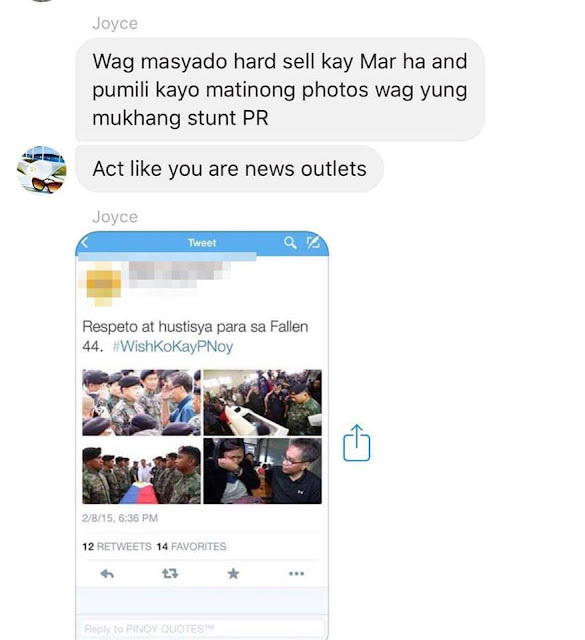 Truth be told, I have already lost interest on the #NasaanAngPangulo issue, until one of my little birds told me a few days ago that the PR operator mentioned in my article – PR Asia Worldwide’s Joyce Ramirez – ordered her fleet of social media allies to attack me online. I think my very highly placed little birds have no motive to lie, so I think it’s reasonable to say, from my end, that Ramirez committed an egregious mistake. You see, I am not the kind of guy who lays all his cards on the table. I always leave a couple of aces up my sleeve for use if and when the need arises. Suffice it to say, let me use one of them against Ramirez today. NOTE: I didn't proofread this article anymore. I'm too tired already. In the February 2017 ThinkingPinoy article “#NasaanAngPangulo: Mamasapano, Mar Roxas’ Ambition, and a PR operator”, I explained that a friend, former National Youth Commissioner and former MTRCB member Michael “Mike” Acebedo Lopez, told me a really good story. 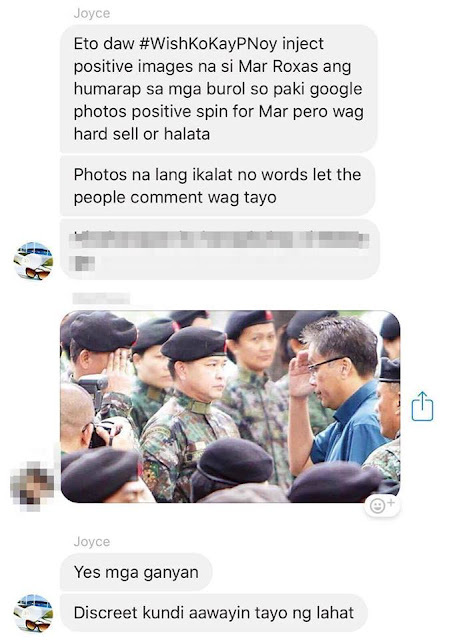 Lopez said that in 2015, then DILG Secretary Mar Roxas, in a desperate attempt to salvage his presidential ambitions, engaged in a multi-million peso black propaganda campaign against then President Benigno “PNoy” Aquino, a campaign that aimed at pinning all the blame on the latter over the SAF44-Mamasapano Scandal, effectively shielding Roxas from Mamasapano-related bad press. According to Lopez, close Roxas aide and then DILG Usec. Tomasito “Tom” Villarin commissioned publicist (i.e. 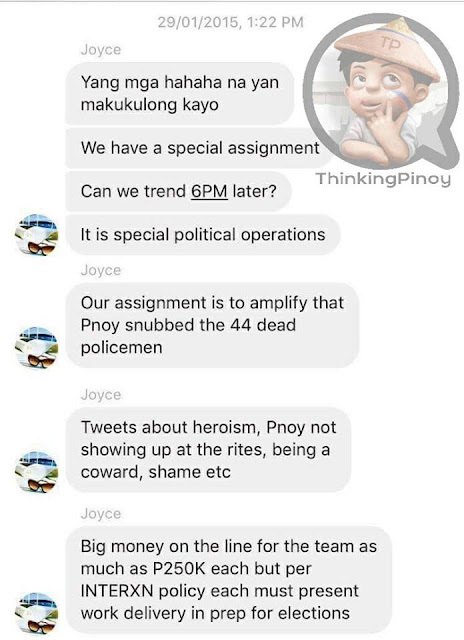 PR operator) Joyce Ramirez to launch a Mamasapano-related Twitter campaign focused specifically against PNoy, in the hopes of minimizing the bad publicity that his principal Mar Roxas, a de facto superior of the SAF 44 policemen, would receive. Lopez did not specifically name Ramirez, but other sources provided me with that information. 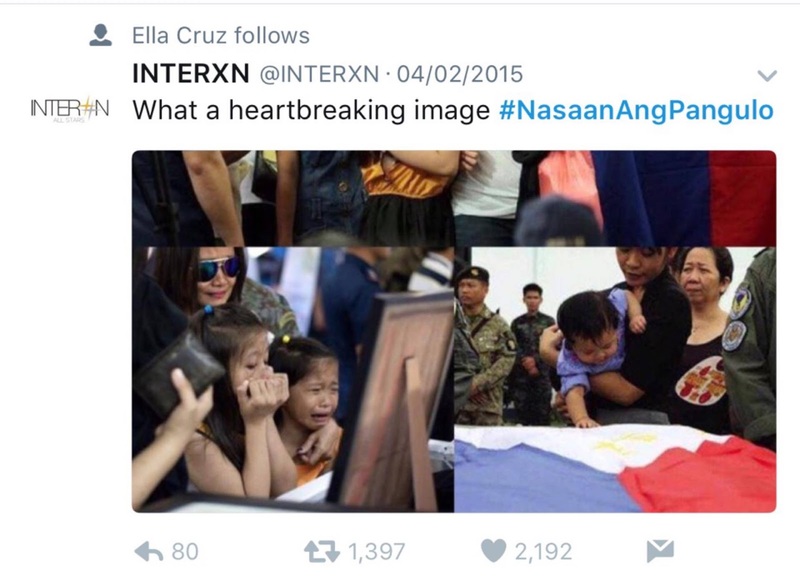 Lopez, who has a hatred of all things yellow, said he helped Ramirez by providing a list of Twitter hashtag, one of which was the “legendary” #NasaanAngPangulo, the hashtag used for the anti-Pnoy campaign that was launched at exactly 6:00 PM Manila on 29 January 2015. 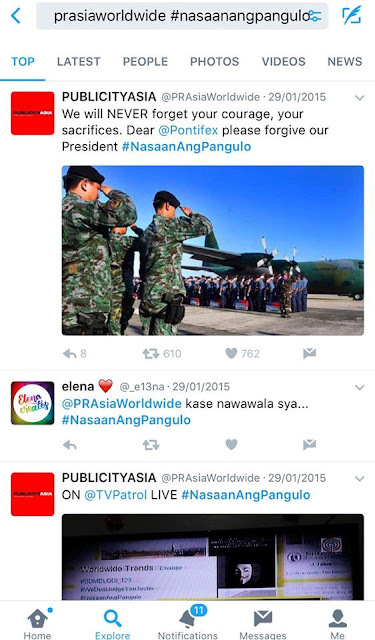 Lopez said Ramirez maintains business connections with major social media players, which allows her to force any issue into the Twitter trending list and like clockwork, #NasaanAngPangulo trended worldwide shortly after its launch. 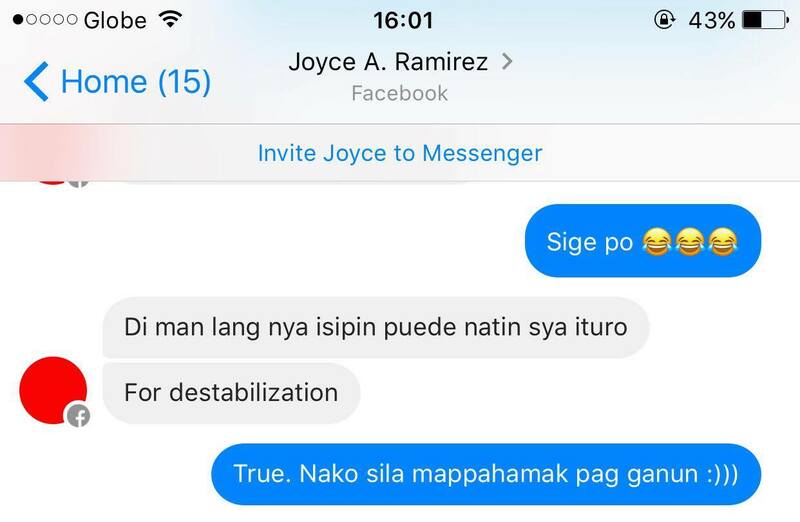 As evidence, I provided an excel file that was last modified in 2015, showing Joyce Ramirez as its author. The excel file basically used the #NasaanAngPangulo campaign as case study that she used for pitching her services to other politicians. 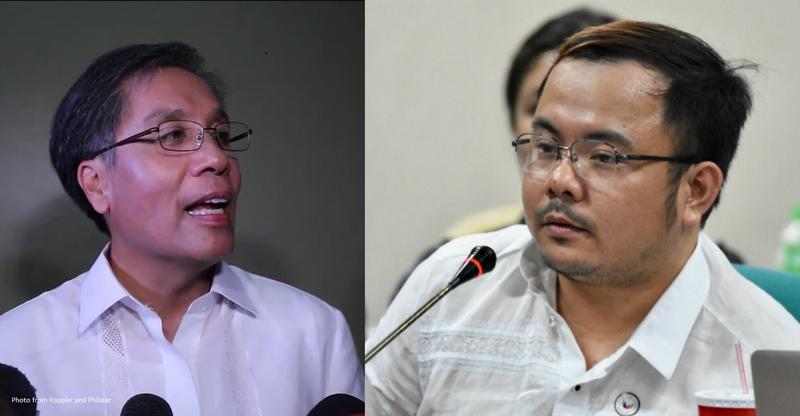 Roxas has since denied links with Ramirez and #NasaanAngPangulo. But that's expected. Unlike many people, I am immune to name calling, so I’ll let that second quotation go. Actually, I was even tempted to let the entire thing go because Ramirez, while an interesting figure, is a very small fish to fry. I think she’s a waste of cooking oil. But based on what my little birds told me, her recent actions warrant an Armageddon. According to my little birds, Ramirez recently ordered her fleet of pro-Duterte influencers to attack my page. I don’t exactly know what triggered her, especially since I never really mentioned her or anything related to her during the past couple of weeks. 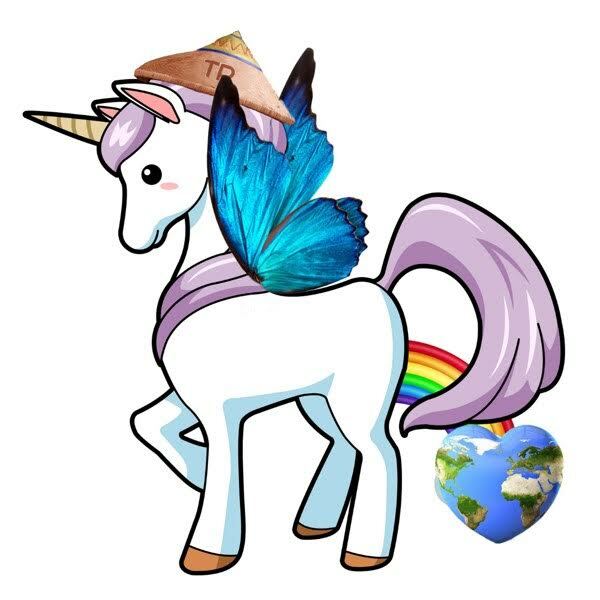 Well, I’ll fart on them rainbows that smell like World Peace with a hint of cinnamon. Like this, Joyce. LIKE THIS. She even appeared to be glad that the hashtag was featured on TV Patrol! But of course, those two screenshots are just circumstantial evidence. We need more... and more is what I'll give you. My mentor, Manila Standard columnist and former editor-in-chief Jojo Robles, taught me how to treat sources. He said I should always wait for a second independent source to corroborate what my first source said. And because I am a very obedient student, I looked for not only one, but two other sources for this issue. I have several other sources aside from Lopez and these two, but I will not be using the information they gave just yet. As I've said, I don't lay all my cards at once. I will take every step to ensure that none of Ramirez’s post-Roxas clients will get entangled in this article, for the simple reason that they may not have been aware of Ramirez’s proclivities. If your name somehow gets entangled, don't blame me. Ask Joyce. Now that we've gotten that out of the way, the two additional sources I have for this article claim that they used to be part of Ramirez’s social media influencer fleet, but they had a falling out because Ramirez is a cheapskate, i.e. they said she doesn't pay people well. I shall conceal the identities of the other two sources because doing otherwise may jeopardize their livelihood. I will, however, provide some relevant – VERY RELEVANT – screenshots. Source 1 then gave me three screenshots allegedly showing Ramirez’s instant messages (IMs) dated 29 January 2015. I have redacted other IMs to protect my source’s identity, then combined Ramirez’s IM’s into one neat graphic. "INTERXN" is what Ramirez calls her fleet of social media influencers. Six p.m. of 29 January 2015? That's exactly what Lopez told me! Ramirez appears to be referring to the arrival of the bodies of 44 Special Action Forces (SAF) slain in the botched Mamasapano Clash. Pnoy was absent during the arrival ceremony, attending instead the opening of a car plant somewhere in South Luzon. I think it’s clear now that the supposed Twitter campaign is against Pnoy. 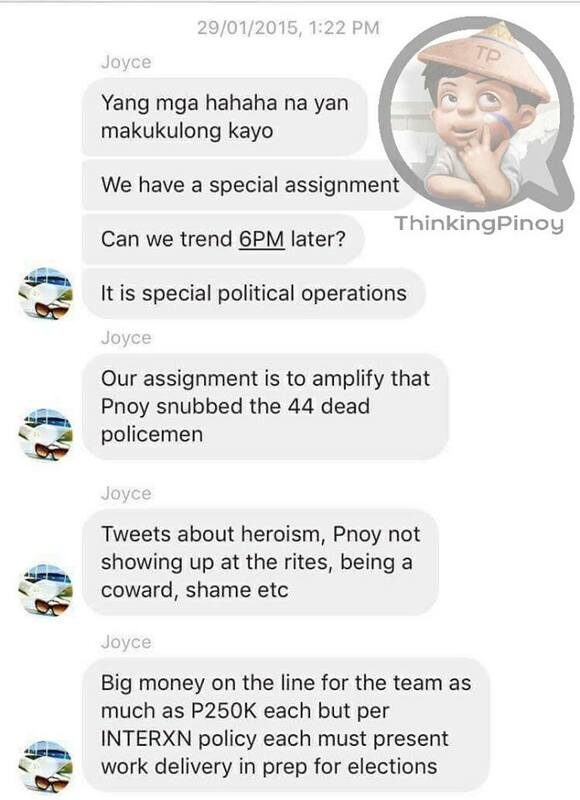 Joyce may have been referring to her influencer fleet when she said “team” and the payment per influence when she said “P250K”. Interestingly, she said “in prep for the elections”. Was she intending to use a supposedly confidential black propaganda operation as marketing material from the onset? I mean, I dislike Roxas, but I kinda feel bad for him in this particular aspect of the matter. 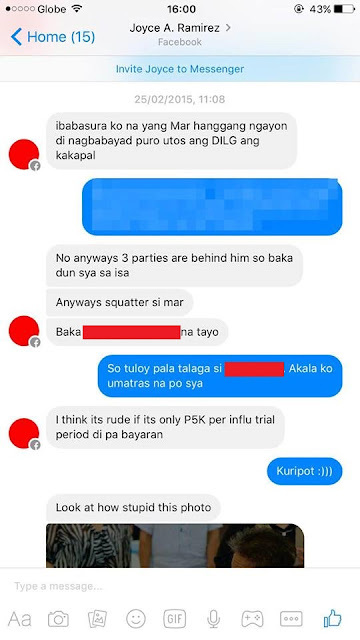 My second source, another former member of Ramirez’s social media influencer fleet, provided me screenshots of their group chats, where Ramirez appeared to be providing specific instructions for yet another anti-Pnoy social media black propaganda campaign. Ooohh, instructions to create fake news? The sample tweet included photos of Roxas taken during the SAF 44 arrival ceremonies. OOHHH, SNEAKY! 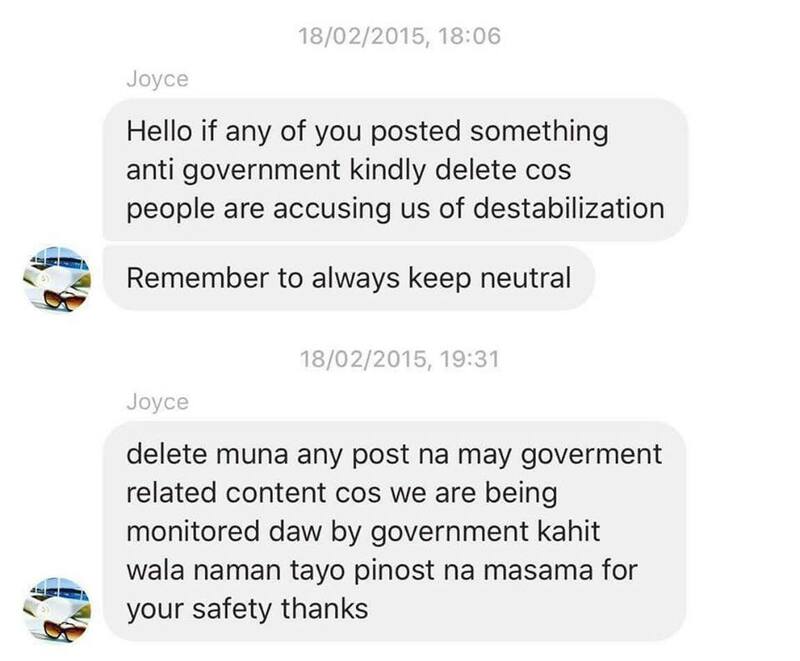 Aktibista ka lang talaga, Joyce? Talaga lang? Based on the evidence, Ramirez appeared to have machinated at least two Twitter campaigns against Roxas’s own principal, President Benigno Aquino III, with the second campaign launched barely a week after the first. 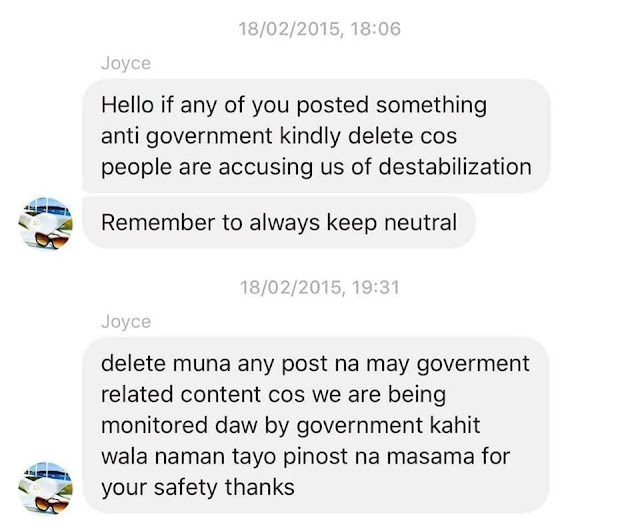 Based on another screenshot, Joyce was acting on someone else’s orders, presumably from DILG Usec. Tom Villarin, basing on Lopez’s information. Judging from the 08 February #WishKoKayPnoy sample tweet, this exchange of IMs happened around 08 February 2015. And yes, it appears that Mar Roxas is indeed the beneficiary of both Twitter campaigns. But Pnoy’s loyal minions in Malacañang seem to have caught wind of Ramirez’s online operations. On 18 February 2015, or a little over a week later, Ramirez re-emerged in the group chat. Ok, hold on one second! FIRST, it’s clear that the two twitter campaigns #NasaanAngPangulo and #WishKoKayPnoy were intended to discredit then President Aquino, so I do not understand how Ramirez could say that “they’re not doing anything bad”. SECOND, it’s also difficult to understand how Ramirez’s fleet of influencers can “keep neutral”, since the two campaigns specifically are black propaganda. Thus, I can only surmise that Ramirez meant the exercise of greater subtlety among her minions. THIRD, it’s interesting that Ramirez seems to have acknowledged the presence of a Pnoy-era online monitoring team. Was Ramirez referring to the “Malacañang Call Center” that former PCDSPO chief Ricky Carandang reportedly created? Was Ramirez referring to the the same Aquino-era Malacañang Call Center where Palace-sponsored cyber operations – including troll operations – allegedly took place? 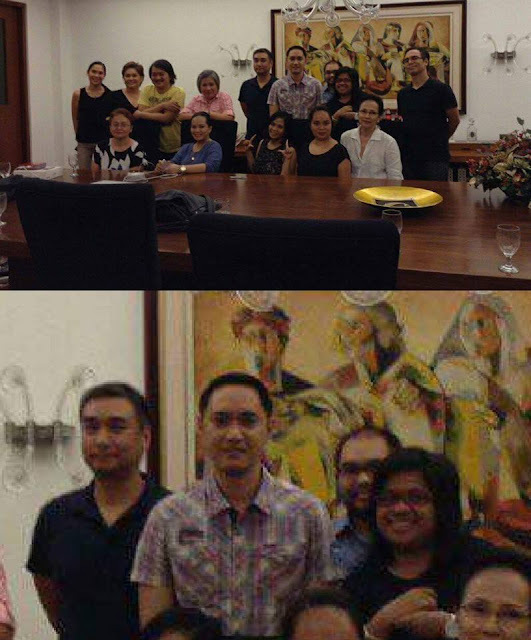 And by the way, Pinoy Ako Blog’s Jover Laurio was seen with Carandang in 2015. Regardless, what’s clear here is that whatever deal Ramirez had with the Roxas camp was more than just a one-off affair and that Ramirez loves sipping her own Kool-Aid. But it gets even more interesting from here. 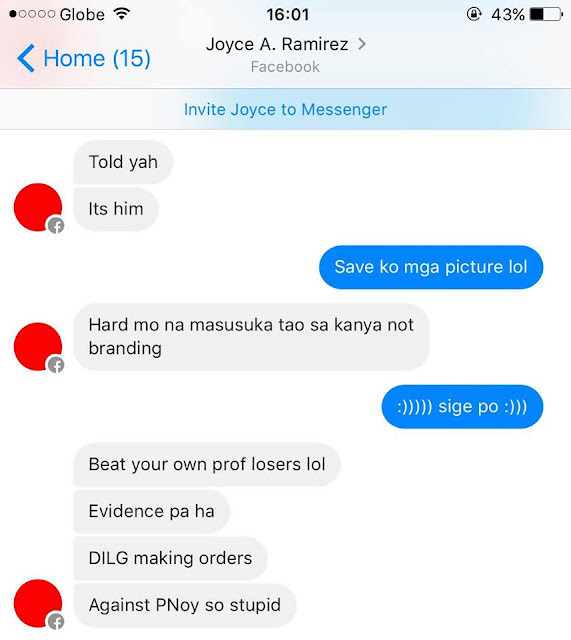 At some point, Ramirez seems to have become unhappy with her deal with Roxas’ camp, as evidenced by a screenshot of her chat with one of her then-closest influencers, provided to me by no less than that influencer himself/herself. "Di man lang niya isipin puwede natin siya ituro for destabilization." According to the screenie, the influencer even offered to save the pictures as evidence. Judging from his screenshot, Ramirez ordered the influencer to hard-sell Mar Roxas, which is the total opposite of her orders at the beginning, which was to subtly sell Mar Roxas and nothing more. Hard selling means blatantly and shamelessly promoting something. This tactic is generally frowned upon by the PR community because it is usually off-putting for target audience. Essentially, Ramirez seems to have instructed her influencers to hard sell Roxas, i.e. still fulfill her agreement with the Roxas camp while sabotaging it at the same time. Yes, at this point, it appears that Ramirez is sabotaging her own client. It's interesting that Ramirez has so much confidence on her PR skills. I mean, if she's really good, then why am I writing this article right now? But how did it come to this point? Why did these even happen? “Ibabasura ko yang Mar hanggang ngayon di nagbabayad puro utos ang DILG ang kakapal.”Ramirez, presumably out of anger or sheer disappointment, called Mar a “squatter”. I am not sure if Ramirez was telling the truth here, especially since she appears to be spiteful during the times those messages were sent. What’s clear, however, is that she may have committed a major mistake: she sent Binay a message that is against Binay. I guess that’s why my sources told me that the Binays never hired her. If I were a Binay and after seeing that, why the hell would I? VP Binay, good call! I think that you, the reader, have come up with your own conclusions about this issue based on what you’re read in this article. However, let me raise some points that you may have missed out on. Two factions, Balay and Samar, dominated politics inside the Aquino-era Malacañang. In as far as presidentiables, Roxas headed the “Balay Faction” while Binay headed “Samar”. At the time, Roxas’ presidential hopes were in danger because VP Binay’s was consistently outperforming him in popularity surveys. Evidence suggests that Roxas’ Usec. Tom Villarin was Joyce Ramirez’s contact, i.e. the one who calls the shots in as far as the two black propaganda campaigns are concerned. Villarin, along with the pretty much the rest of Akbayan Partylist, was affiliated with the Balay Faction, i.e. it is in Villarin’s interest to make Roxas win in 2016. 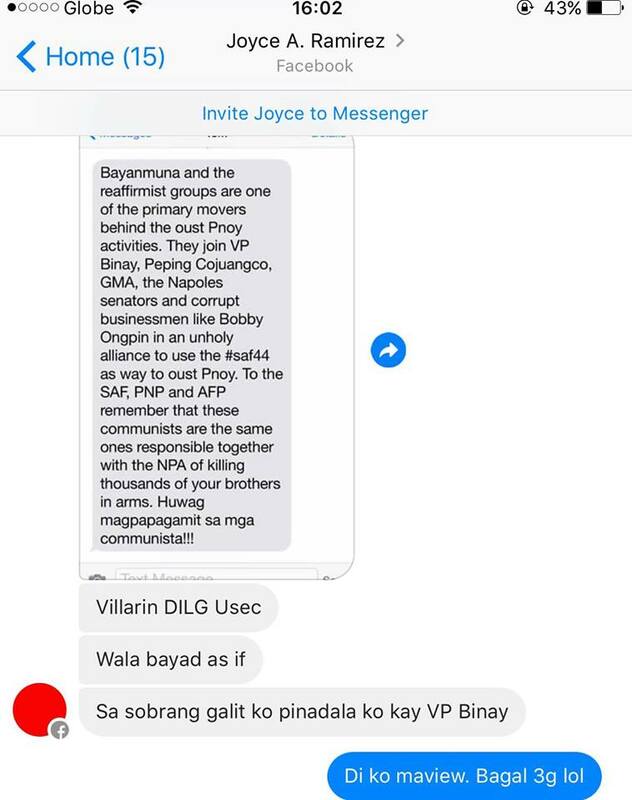 Given available data, it is entirely possible that Villarin and Akbayan launched the aforementioned black propaganda campaign without Roxas’ consent. On the flip side, however, Villarin is pretty much Roxas’ right-hand man in those days, so it’s quite hard to believe that Roxas knew nothing of the operations. After all, have all SM employees personally met Henry Sy? 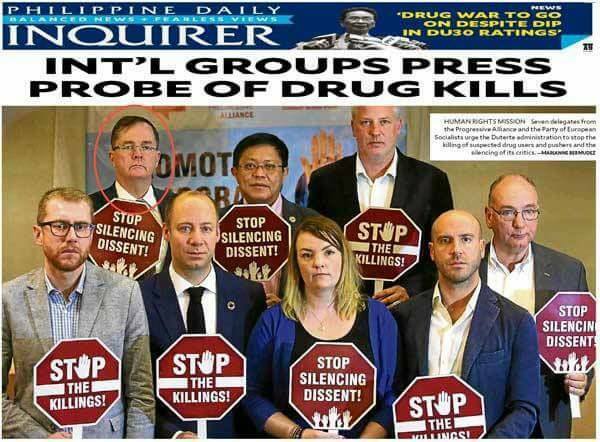 Evidence clearly suggests that that Akbayan Partylist – where Senator Risa Hontiveros belongs – is into black propaganda. Surely, Villarin would not have acted on his own because such a massive black ops requires thorough coordination and funding. But I guess they fell short on funding because Ramirez was pissed. Regardless, I think this adds new color to the recent fake news controversy involving the seven-or-so EU parliamentarians whose photos were splashed on national broadsheets. One of the persons in the picture is actually not even European: it’s Tom Villarin. The brown guy is Tom Villarin. As promised in the disclaimers, I took every step to ensure that none of Ramirez’s post-Roxas clients will get entangled in this article, for the simple reason that they may not have been aware of Ramirez’s proclivities. You are politicians. You need publicity to survive. I understand that perfectly. Besides, I do not like burning bridges unnecessarily. Note, however, that based on the data provided above, it’s best for you to find ways to ensure that Ramirez will not do to you the same thing she did to Roxas. I know all of you, and I think that all of you, despite your respective flaws, have the potential to change this country for the better. Don’t let Ramirez take that opportunity away from you. With that said, I think I now understand why oppositionists like Pinoy Ako Blog accuse me of being a paid hack, because it seems that most political content creators in the past were on the payroll of some PR operator, so they thought I’m cut from the same cloth. I’m sorry to disappoint you, but the best thing I got from any politician is free food. But of course, I do not speak for the other bloggers, like those who pulled the “Poe-Cayetano 2022” issue out of their own @$$. Who knows, would it be outlandish to suspect that they're on Ramirez's payroll too!? Joyce, you need a career shift. Mag-TESDA ka na!